Cloud Telephony refers to the replacement of business phone with the cloud-based phone system. In simple words, it’s a technology that moves your business telephone system to cloud. Cloud telephony is the most trending topic nowadays and it can help your business to grow because it’s one of the affordable ways which can boost your business ROI. We all know that cloud telephony is far cheaper than a traditional method of connecting with buyers. But the traditional telephony systems can’t be integrated with other tools. And if the phone system does not integrate with your CRM, then your inbound sales executive has to manually fill in the details into CRM after a call. This becomes quite hectic but with cloud telephony, you can easily manage the things. Cloud telephony gives you access to some amazing tools which lets sales executive have all the customer history on their fingertips. Cloud-based phone system ensures continuity of business. Your business never gets on hold no matter where you are. With cloud telephony, you can remain 24×7 connected with your customers. Another big plus point of cloud telephony is that its unaffected by outside factors which might keep employees away from the office like heavy downpour or unsuitable weather. You can scale up to more opportunities with cloud telephony. For example – a potential customer landed on your website because of SEO and online advertising efforts. Will you let that potential customer go? No, Never miss an opportunity with cloud telephony. Inserting a small widget on your website can convert that audience into the customer. Because when the customer clicks on CTA widget he will automatically get connected to the agent or else he will receive a pre-recorded welcome message ensuring an agent will contact him soon. This means you don’t lose any prospect. Yes, You heard right. Cloud telephony helps to reduce the operational cost. Cloud telephony will replace the receptionist who attends the call and directs it to the respective agent/ department with VoIP. Thus cloud telephony helps in reducing the operational cost. 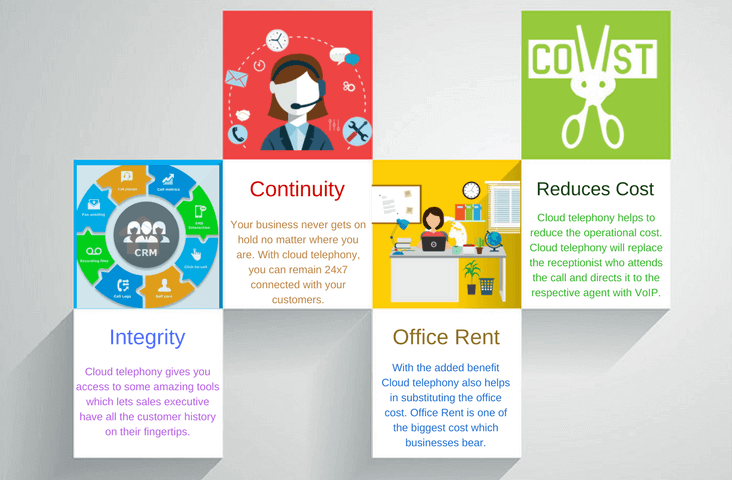 There are many more benefits of cloud telephony which you can consider for switching your business to a cloud-based phone system. But the above mentioned are the evergreen benefits which you can consider without giving a second thought. So are you looking for a reliable cloud telephony provider? Do they chat with you? Does your business require virtual receptionist? Answer these questions and evaluate the providers while choosing the cloud telephony. I don’t deny the fact that there are other marketing tools too out there in the market which can boost your business revenue. But all I can say is cloud telephony will surely take your business to another level. Thanks for sharing the benefits of having cloud telephony for businesses. Cloud telephony grants you full phone-system functionality wherever there’s an internet connection. You can change answering rules, access voicemail and fax messages and view call activity, regardless of your location. Cloud phone service enables you to focus on what really matters: satisfying customers and increasing sales. Keep Sharing! I totally agree with you that cloud-based phone system really helps you to connect with your customers within very less operational cost. It is very reliable, flexible and secure way to boost your company image. When your business is growing and thriving, you need to establish operations to new locations, all you need to do is ask SARV for extension of your cloud-based PBX to the newly opened center by adding a virtual number. By switching over to a cloud-based phone system, you will enjoy the benefits of automatic system upgrades that will allow your staff a ready access to the latest versions of the system in no time.